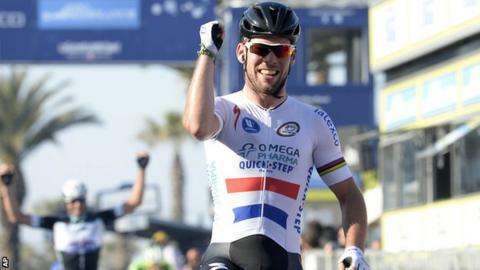 British rider Mark Cavendish retained his lead at the Tour of Turkey by following his opening-stage victory with a win on Monday's second stage. Cavendish, 28, was led towards the line by his Omega Pharma - Quick-Step team-mates before outsprinting his rivals. "It was perfect," said the Manxman who is racing for the first time in almost five weeks after a virus. "I am glad I could finish the guys' work. "They rode incredibly. I'm happy we could get another stage here." Cavendish was given a supreme lead-out by the Omega sprint train, including Alessandro Petacchi and Mark Renshaw, at the end of the 175km race from Alanya to Kemer.. They helped the British national champion to prevail in a bunch finish ahead of Neri Sottoli's Francesco Chicchi and Lampre-Merida's Niccolo Bonifazio. Cavendish, who also won Sunday's first stage by more than a bike length. is expected to relinquish the race lead in Tuesday's third stage, which features features hillier terrain and a summit finish in Elmali.